Are you going to ISTE this year? Even if you’re not, you too can participate in the ISTE Videoconference Playground! Here’s a snippet from Roxanne, Lead Pirate! Work has begun on the Video Conference Playground at ISTE 2011. Last year, I led a band of pirates as we shared our passion for video conferencing with others in Denver. Here are some of the pictures from last summer.This year, in Philly, the playground will be even bigger with more connections and equipment for you to learn about in a fun, hands-on environment. We are looking for more people to help us create an exceptional learning experience for attendees who want to learn more about the power of video conferencing in the curriculum. Read the full post here and see how you can get involved! The afternoon and evening after the ISTE10 SIG IVC Playground experience, several of the members of the planning team reflected about what exactly happened at the pirate playground. What made it so engaging? First, the playground was an outgrowth of our beliefs about learning. People learn best by DOING (as opposed to passive listening). People learn best when given a meaningful engaging task. Adults learn best when given CHOICE. Scaffolding provides the safety net for learning something new. How were these principles in evidence? The attendees were very quickly drawn into dialing out to various IP addresses and talking to educators at zoos and museums across the country. They didn’t just HEAR us talk about it. They DID it! The meaningful engaging task was to figure out who they were talking to – and visiting at least 3 islands before they could win some treasure. They didn’t just talk to anyone – they talked to educators at award winning, high quality zoos and museums that offer programming to schools. Attendees had a choice. They could just visit the one island they wanted to and leave; or they could pick three islands; or many people visited all the islands because they were having so much fun! But they CHOSE! Scaffolding includes providing helps and supports for constructivist learning. Scaffolding included the VC Continuum handout, cheatsheets for the attendees at each station, and lots of printed materials. The pirate crew provided scaffolding to the pirate guides as well: cheatsheets for the guide with contact information and bullet points of what to do; as well as little guides for the welcoming pirates. The instruction sheets made it easy for the pirates to assist at islands where they may have not been an expert at the technology, yet they knew enough about VC in general to pick it up. The participants were never more than 3 feet from a pirate who could answer their questions or direct them to another pirate for more information. Another intriguing result of the playground is where all the learning took place. Some of it was unexpected and serendipitous. The attendees and educators learned and benefited by the opportunity to explore different videoconferencing solutions and connect with content providers to learn about the educational programs available. The content providers benefited by networking with additional educators, getting to advertise their programs, and hearing questions and comments from educators. The pirate guides benefited by all the networking with each other, learning about new content providers, trying out different equipment, and sharing resources and projects with new videoconferencing educators. The videoconferencing vendors also benefited! In addition to showcasing their equipment, they got a chance to see how educators actually use their equipment. One of the vendors represented brought two more software developers to experience and see first-hand what educators are using VC for. Interestingly, the reaction of the pirates to the playground reminded me of Daniel Pink’s new book, Drive. You can watch the 18 minute Ted Talk here. Yes. Go watch it now. I’ll stay here! The purpose. All the pirates believe in using videoconferencing in the classroom; are passionate about it; love to share that passion with others. Fun and Interesting task/theme. Pirates supplied all of their costume except the hat. They really got into it! The engaging learning. Pirates stayed longer than they had planned to. Some volunteered on the spot and were given a job! Craig Moellerstuen, one of the pirates, found this in his fortune cookie. It aptly describes the pirates’ attitudes! Are you subscribed to Roxanne Glaser’s blog? If not, you missed a great write-up of her workshop on Sunday morning of the ISTE 10 conference. Unfortunately I was flying, so I missed it! Roxanne is a master at using collaborative asynchronous tools to support the videoconference project. Here’s the description of her workshop to convince you to check out her blog and wiki. This session will model social constructivist learning theory using videoconferencing and supportive technologies. It will be an experience where participants will actually take chapters from the novel, create presentations using wikis, webcams, cameras, etc, and then share and connect to experts and others via video conference. This session is designed for teachers and technologists who would like to engage reluctant intermediate and middle school students to read and write. The mixing of Skype/video conferencing and Web 2.0 technologies is a fundamental principal to increasing and improving the learning opportunities afforded students participating in a distance-learning, “virtual field trip,” style learning event. 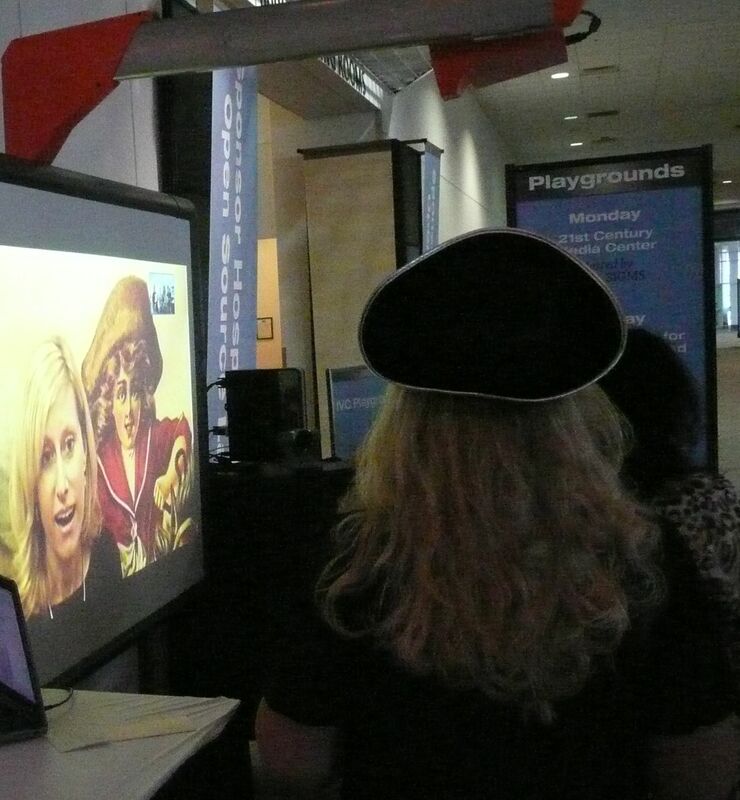 Background: The SIG IVC Playground at ISTE 2010 featured six videoconferencing islands. Participants tried out two HD units and four desktop videoconferencing solutions. We used a pirate theme to make the learning and exploration fun. At each island, attendees had to talk to people in mystery locations to figure out where they were and which content provider they were. In this blog post, I share the experience from the Polycom HDX island. Polycom provided the HDX equipment that was used in the playground and in the SIG IVC room throughout the rest of the conference. In this picture, Danny Maas from Edmonton, Alberta is the pirate guide. We used the Promethean board display and projector (supplied with the playground) as a screen and method to show the video from the HD system. These systems are more often set up with carts in schools as shown in pictures here. In the picture above, note the equipment. The microphone (designed for room systems) is sitting on the stool. The remote control for the system is in the participant’s hand. The camera is to the right of the Promethean board on a small table. The videoconference system itself (sometimes called the codec) is also on the table to the right of the Promethean board. These are typical basic components of all videoconference hardware solutions. In this picture (by Lori Colwill), you can see the microphone on the stool if you look carefully. Note also how well this island handled groups of people. In this picture you can see how good the quality is and also how the picture in picture (or self-view) shows up in the top corner (can be moved around). Since my daily job is connecting my schools (with Polycom VSX 7000s and Viewstations) to lots of similar systems around the country, including all different kinds of Polycom systems, I didn’t really learn anything new. This island worked successfully and steadily just as I would have expected! Also, as expected, this island handled groups of people much better than the desktop videoconferencing islands. One thing I wanted to learn though, is how to use the far end camera control to change the layout of the conference when dialed into a Codian bridge. We did have a Codian from REMC 1 on the list of places to dial, but I never got a chance to play with it and figure it out. Too busy solving other problems and issues with the playground. Do you know? Please comment! Did you make it to the ISTE IVC Playground? Or have you played with Polycom HDX before? What would you add? In this blog post, I share the experience at the TANDBERG HD Edge island. Tandberg/Cisco provided the HD equipment that was used in the playground and in the SIG IVC room throughout the rest of the conference. Several Tandberg staff from the booth came by to help out at this island during the playground as well. In this picture, Amy Spath from NY is the pirate guide. She is behind the attendee and has a parrot on her pirate hat. In the picture above, note the equipment. The microphone (designed for room systems) is sitting on the stool. The remote control for the system is in the participant’s hand. The camera is to the right of the Promethean board on a small table. The videoconference system itself (sometimes called the codec) is on the floor to the left of the Promethean board. These are typical basic components of all videoconference hardware solutions. This picture gives a better view of the codec on the floor to the right and the camera on the table to the left. The participants at this island just got a special prize because they found the pirate at The Mariners’ Museum! Since my daily job is connecting my schools (with Polycom VSX 7000s and Viewstations) to lots of similar systems around the country, including all different kinds of Tandberg systems, I didn’t really learn anything new. This island worked successfully and steadily just as I would have expected! 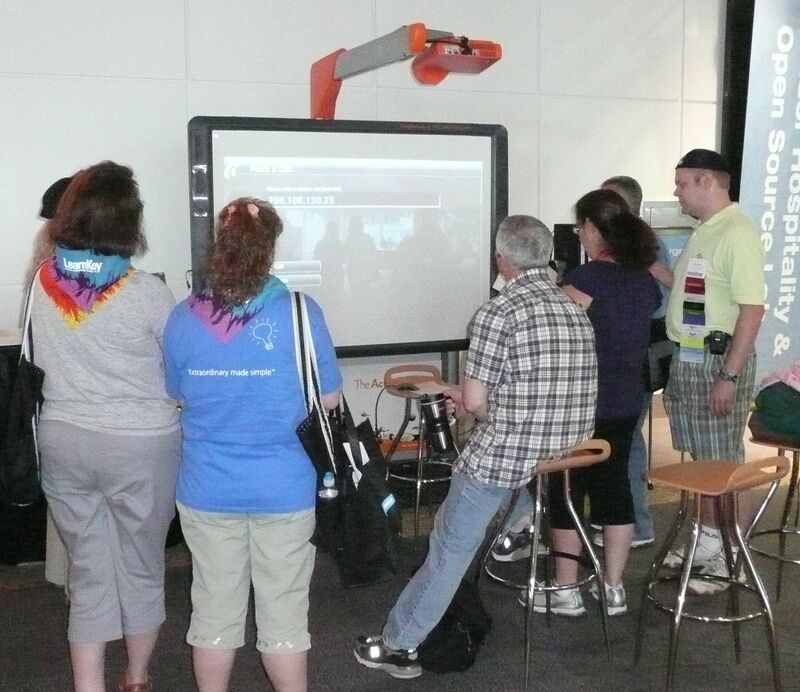 Did you make it to the ISTE IVC Playground? Or have you played with Tandberg Edge HD before? What would you add? In this blog post, I share what we learned at the Vidyo station. GCI Alaska assisted us with the Vidyo island setup and provided pirate guides for that island. In this picture, Craig Moellerstuen explains Vidyo to an attendee. At this station, the web cam used is a Logitech Quickcam. The audio/speakers used were the Phoenix Duet Executive. I have played with Vidyo several times before (here, here, here, here), and from what I noticed at the playground, it worked very well as expected. Quality was awesome! Vidyo is a great solution for bringing in remote sites to H323 calls – i.e. Craig uses it to bring in guest speakers to talk to students, to connect students who are at remote locations in Alaska to their VC classes, etc. The beauty of it is that you just send a link to the participant – and they just download a little tiny app to get started. Very easy and no messing with the firewall to make it work for the end user. One thing we ran into is dialing aliases. We had planned to put only straight IP address dialing on the Vidyo island; but I messed up and assigned an alias@IP format to it. We weren’t able to get it to connect directly. How does Vidyo handle the Codian menu structure, the Tandberg MPS / endpoint behind a firewall format of alias@IP, and the Polycom IP##alias format. How do we make it do that? I would like to learn. Please comment if you know! Did you make it to the ISTE IVC Playground? Or have you played with Vidyo before? What features should be mentioned? Please comment and be sure to read the comments! In this blog post, I share what we learned at the Elluminate Live station. In this picture, you can see that James Yasko, of The Hermitage, Home of President Andrew Jackson. This station did not feature H323 videoconferencing. Instead we were featuring web conferencing. The Hermitage is one of several content providers who are exploring offering their programs to schools in the web conference format so as to reach a wider audience. We stayed connected with The Hermitage for the whole playground time. This island was set up with a headset and a Logitech QuickCam Orbit. The laptop, headset and webcam were provided by Whirlidurb. In this picture, you can see that one of the participants was talking with James, while the others are making notes about this island on their “letter of marque“. At times the Elluminate island was jam packed and crowded! The content is the main feature of webconferencing; video is “on the side”. This format works well for PowerPoint-like presentations. Elluminate has another product – Elluminate VCS – which connects to H323 systems. I would like to know more about Elluminate VCS. Maybe next year! Did you make it to the ISTE IVC Playground? Or have you played with Elluminate Live or VCS before? What features did I miss? In this blog post, I share what we learned at the CISCO-TANDBERG MOVI station. In this picture, Lori Colwill assists an attendee with dialing out to a mystery location. Tandberg MOVI needs to be installed with the VCS (firewall traversal box). If you already have TMS, you can get MOVI as an option key with Tandberg Management Suite. We were not able to get the far end camera control to work to navigate a Codian bridge menu. But it worked with DTMF tones. Not sure if that’s just because we don’t know. If you know, please comment on this post! Just like all Tandberg equipment, it can’t dial the IP##alias format; but this blog post has tips on getting around that which sometimes works depending on the other site’s setup. Did you make it to the ISTE IVC Playground? Or have you played with Tandberg MOVI before? What features did I miss? In this blog post, I share what we learned at the Polycom CMA Desktop island. In this picture Marci Powell of Polycom answers questions, while Sue Porter assists another attendee. I had played with CMA quite a bit before (see previous post). But I did learn two new things. Zoom Sharing. When you’re sharing your computer (H.239), you don’t have to share your whole screen. You can use the zoom feature to choose just a small part of your screen to share. (It reminds me of the Jing recording screen selections.) Pretty sweet. This allows you to have your slideshow smaller, a chat window, and the far site in different areas of your desktop. Multiple USB Cameras. Version 5 of CMA allows you to change cameras on the fly during the connection. So this way you can switch to, say, a USB document camera during your call. I am very interested this option because my schools interested in desktop VC have been asking me about using a document camera with it. However, I was so busy at the playground I didn’t get to see it in action yet. Have any of you? Please comment! Did you make it to the ISTE IVC Playground? Or have you played with Polycom CMA Desktop before? What features did I miss? Please comment! Another fun happening at the SIG IVC Playground last week was how the various content providers got into the spirit of the pirate theme. Initially the pirate crew planned to have a pirate at The Mariner’s Museum. When people dialed in and found the pirate, they got an extra cool prize! You can see what that looked like in this picture. This was the Tandberg MOVI island. This idea worked well, but then we had a couple other content providers get into the pirate spirit. Christina and Rich really got into the pirate theme! This was their welcome screen when you dialed in. This was at the Polycom CMA Desktop island. Rich had rigged his sled into a ship! Finally, Karin at the Royal Botanical Gardens in Ontario got into the spirit of things as well. This was at the Tandberg Edge HD island. As you can see, we used a Promethean board for the display/projector for the setup. In future posts, I’ll share the setup and some highlights from each of the six islands.